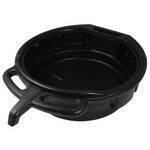 Ideal for the home motorcycle mechanic - A selection of oil drain pans, for easy collection of waste oil. No more cutting old oil cans up to catch the oil, or the trusted washing up bowl. Unfortunately changing oil on your motorcycle can be a messy job. These oil pans will hopefully make the job a lot less messy. Please dispose your waste oil sensibly, check you local 'Oil Bank' facility. 10 litre Oil Drain Pan. Large capacity oil drain pan.